Area rugs are a great way to add a focal point in any room and can tie a room together from a design standpoint. Beyond their artistic value, area rugs also can add comfort and warmth on harder surfaces such as wood or tile flooring. As area rugs tend to be the glue that holds the room’s design aesthetic together, it is important that your area rug be your starting point. From their you can pull from the area rug to add other design elements to your space. But how to choose the right rug for your space? It certainly depends on your overall preferences but there are also some general rules that when followed, make it much easier to narrow down what you are looking for. 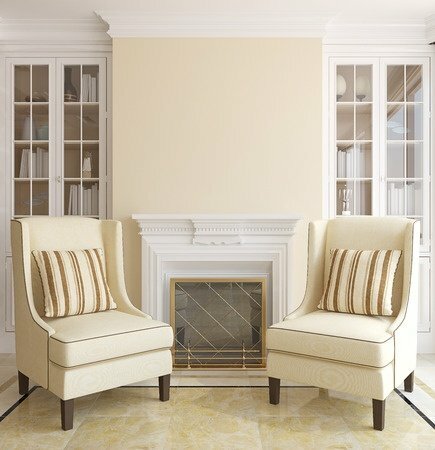 The first thing to consider is where your area rug will be and what purpose will it serve. In a transitional area, such as between rooms, a rug that acts as a runner is a great idea, flowing from space to space. At least as narrow as your doorway or even narrower is best. This will create a natural transition between spaces and won’t feel super bulky where it shouldn’t. In other rooms, such as the living room, consider how much space you have. If you are looking to create a space for your living room furniture, be sure to purchase a rug that is large enough. Generally, the furniture should have at least the front legs anchored to the edge of the rug so that it ties everything together. 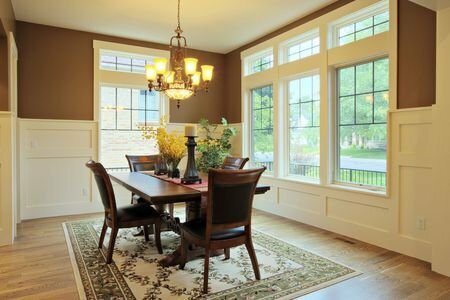 If you are looking for an area rug to compliment your formal dining area, the best rule of thumb is to match the shape of your rug to the shape of your dining room furniture. This will create a look of cohesion between the two pieces as a dining room set is often the focal point of the dining room already. By matching the shape of the table, you are not detracting from the table’s presence but merely adding to it. These are just a few ways to think about area rugs when you are looking to purchase one for your own space. Once you have a better idea of what to look for depending on your space, the better idea you’ll have about where to start. Color is a very important tool in interior design. Unfortunately, this is one area that many homeowners shy away from. The idea of using too much color can be overwhelming and many designs end up with an overall washed out feel. Don’t be afraid to incorporate splashes of color into your own space! Read below to find out how! Both images above are photographs similar rooms. However, the two spaces are decorated quite differently. The first photograph is a success due to the use of color. The second photograph looks nice but is quite vanilla. It lacks excitement. Excitement and interest keep the eye moving around a space. When this takes place, details are noticed and the room feels complete to the people in it. The sun inspired mirror has a gold/yellowish finish, which in turn ties together the bright yellow upholstery with the rest of the space. Choose art and accessories that tie together different colors of your color scheme! 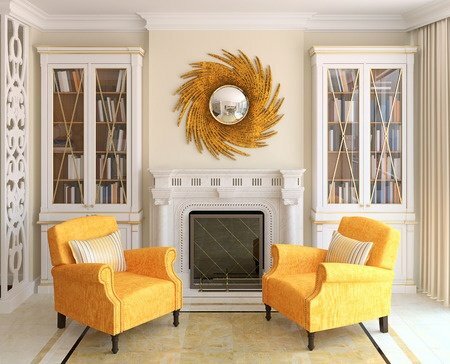 The bright yellow adds life to the traditional space. This goes to prove that most design styles can and should be implemented with the use of color. If you are apprehensive to use color, consider selecting one powerful color and keep the back drop neutral. All colors create a different result. Colors actually invoke different feelings in a person. Yellow, for example, evokes excitement and happiness. If there is a certain mood you would like to achieve within a space, do some research and find out what color will help achieve a your desired mood. For example if the plan for a room is to be a place of calm and relaxation, you can use soft blues or lavender hues. Do not be afraid of color, simply plan ahead and experiment along the way! With the Fourth of July fast approaching you may find yourself beginning to plan what you want to make for your guests who are coming over for the annual celebration of our country’s independence. Before the fireworks fly and the marshmallows are roasted over fires, hosts and hostesses are faced with the task of feeding their guests, and for some this could mean dozens of mouths to feed. One solution sure to make your life easier is to incorporate skewers into your menu. They are incredibly easy to throw together ahead of time meaning your day-of cooking list will be that much shorter. Preparing them is a breeze and some require nothing more than refrigeration before serving while others are simply thrown on the grill. One great skewer for your party are caprese skewers. These are incredibly easy to throw together ahead of time and simply put them into the fridge until you want to serve them. All that is required is cherry tomatoes, fresh basil leaves, and marinated mozzarella balls. 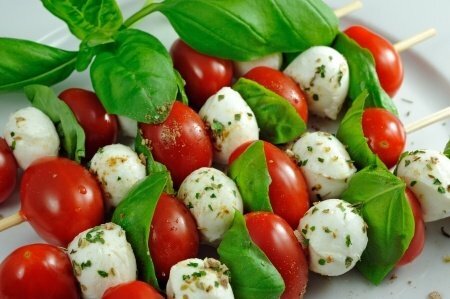 Thread the tomatoes, mozzarella and basil onto the skewers in whatever varying pattern you prefer. Using the leftover mozzarella marinated oil, drizzle this over the skewers on a platter along with a drizzle of balsamic vinegar as well. Throw a dash of salt and pepper over them and simply throw them in the fridge until you plan to serve them. Another great skewer option is to chop up a bunch of summertime vegetables such as squash, zucchini, bell peppers, tomatoes and onions and arrange them how you prefer on a skewer. Season them with a drizzle of olive oil or your favorite vinaigrette, before throwing them on the grill. Once cooked, these skewers can be eaten as a healthy side of vegetables or they can be added to burritos, sandwiches, pitas, or even on top of a salad. These can also be prepared ahead of time and thrown in the fridge until they are ready to be cooked. These two healthy vegetarian options are great alternatives to slaving over time consuming vegetable side dishes. They are easy to make, easy to store, and easy to eat when served. It’s summertime and nobody likes to eat with their knives and forks when the sun is out! Have you ever longed to have a special reading nook just for you? Creating this space is easier than you may think. Find out how one chair, a rug and a little planing can turn into your favorite spot! Find a chair that is comfortable and aesthetically pleasing to look at. This exposed wood, French chair is beautiful and quite functional as well. The seat cushion is filled with a foam core, surrounded by goose down. The tight upholstered back provides good support and a slight incline that will make it easy to relax. Sitting in this chair will make the person feel relaxed and ready to read. Creating the setting for anything to happen, in any book of choice. A simple yet comfortable ottoman is all that is needed to turn a chair into a lounge chair. This particular chair is not considered a lounge chair. However the ottoman turns this formal chair into the perfect lounge chair. Not a lot of space is needed to create a reading nook. Enough space is needed for the chair of your choice, a small ottoman (this pouf is a perfect item when low on space) and a small accent table. The small accent table is needed for resting a drink and a book. When reading people like to drink tea, coffee or a cold beverage. 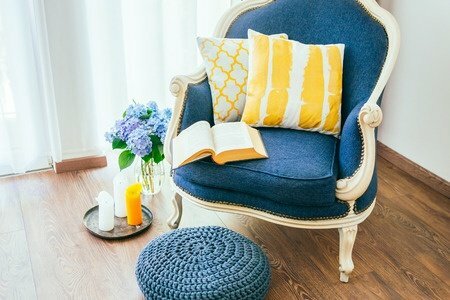 Adding a small rug under the chair will form a designated reading space, just like that! We would suggest starting with deciding the area you want to designate as your reading nook. Then mark out the area with an area rug. Add a chair that you love and from there you can select an ottoman, accent table and a cozy lap blanket. Feel free to add a floor or table lamp if the lighting is scarce. If there is one thing you need in a reading space, it is light! This is very important in a space used for reading. Let us know how you have decorated your reading nook. Leave a picture in the comments below! Father’s day is fast approaching. This year show Dad how much you really care, by giving him a gift that he will enjoy and get some use out of. First think about what hobbies he is into and how he likes to enjoy his free time. Save the socks and cuff links. Spoil him this year! An amazing gift for dad is an upgrade to his favorite area in his home. Does he spend his spare hours in his workshop? Make his time there more enjoyable by replacing the floor in the room! Does he love to cook? His kitchen would no doubt benefit from a change in the floor. Every time he’s in the room, he will remember you and your thoughtful gift. A modern and sophisticated back pack is a great gift for almost any dad. Choose one that looks modern and in a color like gray. This way he can take it to work with him, or use it on a day hike. Masculine phone valets are a good gift for any man in our life. It is a station that can charge his mobile phone, store his wallet and keep his keys. A phone valet is the perfect little spot to keep all of the things he needs to grab before leaving the house. There are also some great leather phone cases that protect the device and double as a wallet. This will eliminate one more thing that dads have to carry around in their pockets. You can also have it embossed with his name and email address, in case it gets lost. This makes it easy for someone to return the wallet/phone. If dad has a smart watch of some kind, get him a new band or two. There is a nice variety of these available at many various prices. It is always nice to have different bands that can be changed out for different moods or occasions. Get him a nice game set, depending on the game he likes. There are beautifully constructed game sets available for poker, chess, backgammon and many others. This is also an activity the two of you can use to spend some quality time with one another. A nice Bluetooth speaker is great for dad. He can wirelessly connect his phone to the speaker and listen to music while working in the yard, tinkering in the garage or relaxing on the deck. This is a gift that keeps on giving. There are many available that produce quality sound that can match up to a small stereo! No matter what your dad loves to do in his spare time, there are amazing gifts for him. Stretch your imagination this year and surprise him with your thoughtful gift!